If scriptwriters, high on crack, had come to a film producer with the script of Meet The Markles, they would probably have been run of town, so improbable is the concept and so unlikely the characters. But wow, what a movie! Our heroine, Meghan, (played by Meghan Markle), a mixed race actress from humble beginnings, meets Prince Harry (Ed Sheeran, fresh from his acting debut in Game of Thrones). His father, Prince Charles (Sir Ian McKellen), is heir to the Throne of England. Charles is not very popular amongst his future subjects, having divorced his wife, the late St Diana of Kensington, after he was caught carrying on with Camilla, now the Duchess of Cornwall (Dame Helen Mirren). Meghan and Harry fall in love and decide to get married. Then the trouble starts. Meghan’s mother Doria Ragland (Oprah Winfrey) is able to pass muster but the other side of the family is rougher than a bear’s arse in a sandpit. Meghan’s father Thomas (Jack Nicholson), is a reclusive slob, having skipped town years ago to escape his credit card bills and is holed up in El Crapo in Mexico. His son by his first marriage, Thomas II, (Russell Crowe), Meghan’s half-brother, is a window fitter aged 50 in Nowheresville, Oregon. He and his girlfriend Darlene Blount, who is 36, (Maggie Gyllenhall) have each been arrested for assaulting the other, he by pointing a gun at her head, she for beating him up, in both cases whilst they were pissed as farts. He and Meghan have not spoken for years. Thomas II’s sister, Samantha (Sandra Bullock), 51, is sadly confined to a wheelchair and has a tongue like a barbed wire enema. She has also not spoken to Meghan in years and has fallen out with her own mother and her own daughter. And there is Thomas II’s ex wife, Tracy Dooley (Sarah Jessica Parker), who lives with her two sons Tyler Markle and Thomas Markle III (Ansel Elgort and Timothee Chalamet) on a marijuana farm in Oregon (it is legal to grow it there) where they are marketing a variety called Markle’s Sparkle which, apparently, tastes of blueberries. Not surprisingly, only Doria and Thomas 1 were invited to the Wedding. Thomas 11 probably blew his chances by writing to the groom calling the bride-to-be “a jaded, shallow, conceited woman” and, in an open letter he provided to the news media, he warned that their nuptials would be “the biggest mistake in royal wedding history,” which suggests he knows very little about royal marriages. Samantha announced last fall that she is writing a book (allegedly fiction) called “The Diary of the Princess of Pushy’s Sister.” Such behaviour was unlikely to get her onto the exclusive list of 600 guests. Darlene is heartbroken, telling the press “I’ve always been a fan of Prince Harry. I would love to meet the royals. I’d buy the prettiest dress if Tom and I can go to Meghan’s wedding”. Sweetie – it ain’t happening. Tracy accepts that not having seen Meghan since 1992, her right to an invitation was, at best, tenuous, but it has not stopped her from flying to London where she will appear on TV endlessly over the weekend giving her insights into someone she has not seen for 25 years. WTF mourns her absence, as she, Tyler and Thomas III could have replaced the dull-sounding lemon and elderflower wedding cake with some Markle Sparkle brownies…..
As for Thomas I, he was due to walk his daughter up the aisle, although neither he nor his ex wife had ever previously met his future son-in-law. But some time last week, Thomas 1 blotted his copybook by being snapped preparing for the wedding (being fitted for a suit, reading books about English history), which had all been set with up the paparazzi by Samantha to earn her dad a few bucks. Uproar followed, at which point Thomas announced that he was suffering from heart problems and would be unable to make it to Windsor on Saturday as he was having a stent inserted instead. Frankly, rather than put up with any more of this guff, many of us would elect to do the same…. Let us begin the week’s clothing review with former singer and Simon Cowell muse Sinitta, wearing something called a body chain by Diva Choice. That is not a top. That is a Christmas tree decoration. To the Cannes film Festival, where beautiful women kept forgetting to get dressed before venturing onto the Red Carpet. There were people probably wearing more on the beach. We start with Marion Cotillard (right) wearing Guy Laroche. The woman on the left is actress Vanessa Fiulho, who looks fine. Oh Marion! You are so beautiful but wearing a mosquito net with your chest and never regions redacted is not fashion, not even at all. Guy Laroche – you should hang your head in shame. This is essentially some armour plating worn with a crotch curtain, and it is very, very bad. Another model, Izabel Goulart ,wearing Zuhair Murad. Zuhair did not even bother with the crotch curtain. This is just a bodysuit with an embroidered minge mask and matching tablecloth. What happened to the old fashioned concept of a skirt that goes all the way around the waist? Asking for a friend…. Still on the Red Carpet, this is Chinese actress and singer, Li Yuchun, wearing Jean Paul Gaultier Haute Couture. Haute Couture? Li is standing with one leg inside a deconstructed barber’s pole. 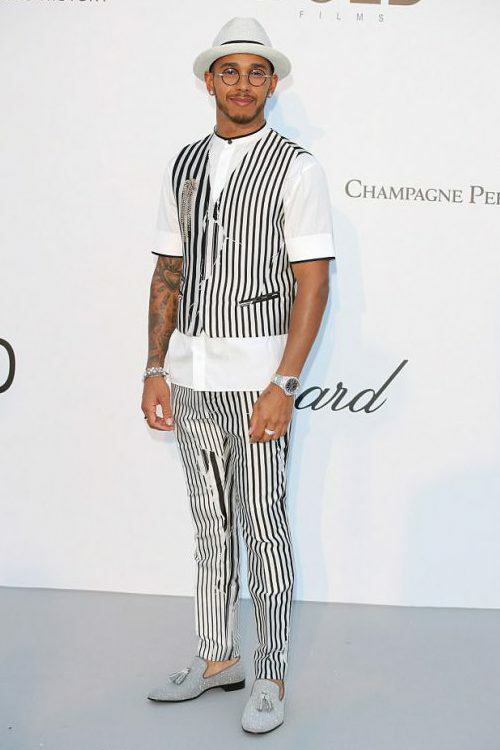 And, at the AmFAR gala, fashion victim supreme, racing driver Lewis Hamilton, AGAIN looking like a prat. Away from London we visit the BAFTA TV awards, where we encounter Strictly Come Dancer Katya Jones, wearing ASOS and a hat by Magia manus. For some reason, Katya is wearing a hat inspired by those worn by Air France Stewardesses about half a century ago, whilst the dress is a minge moment waiting to happen. And finally, at the same event was Radio 1 presenter Clara Amfo, wearing Marques Almeida. Clara needs to call in Rentokil at the earliest opportunity as there appears to be an infestation in her wardrobe, particularly evident with the minge moth hole. That is one ugly dress…. This week’s It’s Got To Go comes (separately) from WTF aficionados Dean and Sue, both of whom are aghast at the range of merchandising tat available for the Royal Wedding. 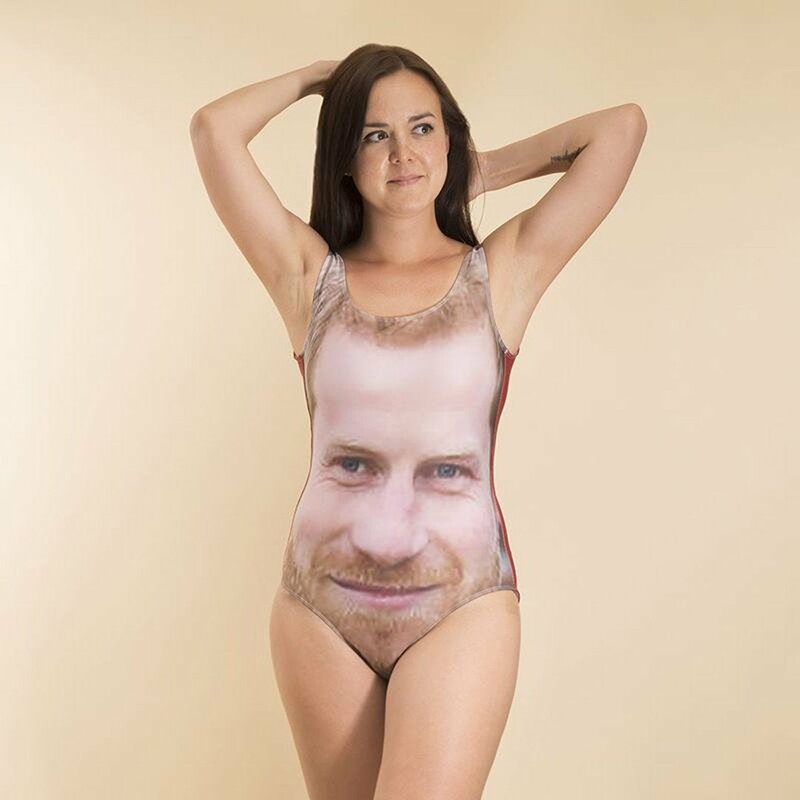 This is by far the worst, a swimsuit featuring Prince Harry. Unfortunately, his ginger beard is not in the most appropriate place. Careful now!!!! I mean, WTF need not say anything, right? Except It’s Got to Go. This entry was posted in amFAR, Cannes Film Festival, Fashion, Fashion Disasters, Meghan Markle, Prince Charles, Prince Harry, Princess Diana, Royal Engagement, Uncategorized, Worst Dressed Celebrities and tagged Clara Amfo, Izabel Goulart, Katya Jones, Lewis Hamilton, Li Yuchun, Marion Cotillard, Natasha Poly, Sinitta. Bookmark the permalink. Why is Natasha Poly standing like that? Does she need to go to the loo? Should have gone before she left the house. *Starting with Its Got To Go. No It Doesn’t. Haven’t had a good laugh like this in a while. I didn’t recognize the face (and yes, the beard is questionably located), but if it was my face there I’d be wearing that same grin. Oh yes! I’d rather not. I was aware that there was a wedding, but only because of the debate on how to invite the Obamas without inviting the current President of the United States. I argued in favor of inviting the Obamas and snubbing Mr. Trump. After all, the British monarchy will be here long after that orange kidney stone is flushed from our system. While I do congratulate Harry and Meghan and wish them the best of luck, royal weddings aren’t my thing. Too far over the top for my taste. Of course anything more than an elopement is too far over the top, which may be one reason why I’ve never been the guest of honor at one. *Li Yuchun. One of us may be dealing with a case of color blindness, but barber poles are normally red and white. *Lewis Hamilton just needs to add a yellow star to complete that authentic Dachau look. He even has a tattoo on his arm. Has he not heard of Nazi Germany? Just seen this online. Whilst such adornments could look amazing on a well toned derriere in a burlesque show, the thought of it on the average British bottom in the muddy fields of Glastonbury makes my heart sink. It’s got to go! Amazing to think there is a family more dysfuntional than the Royals. But at least our’s did it with a little bit more style. I love the idea of a minge moth hole!